Jen’s life is totally my life right now. I finished yesterday and now I have nothing else to do. Guess that I gotta play Super Smash Bros right now. …I’m suffering from writer withdraws please help. There’s nothing more to write about. I’ve never finished my novel sooner than the 29th. I rarely finish it during the month at all. I don’t mean reaching 50k, I mean finishing the actual story. So usually, when I hit 50k, I just keep going. Some years, that means 200 words per day and the story still isn’t finished. This year, I am very close to finishing the novel. 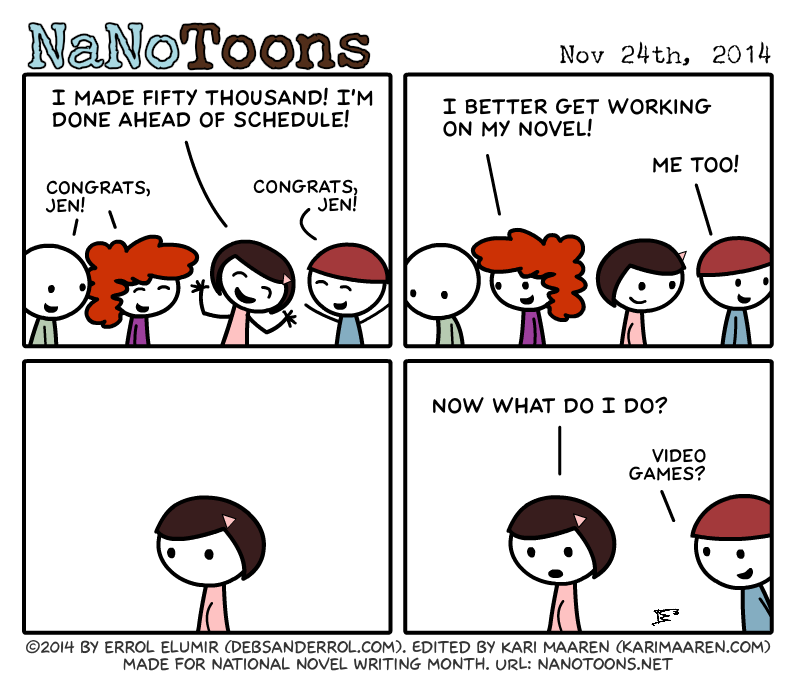 I will probably have 4-5 days at the end with no novel to write. However, I have already committed myself to getting to 100k words this year, and at least one person is holding me to that. So I have to come up with something else to write until the end of the month…or until 100k words at least. Other people in my region who are done are just done. And at least one person is going right into editing. Video games seems as good as any plan. For Jen’s immediate future, sleep comes to mind. I never stop once I reach 50k, because my story is never done at this point. Jen: relax for a couple of days. Then ask yourself: are you finished with the story (not just the 50,000 word goal). If you’ve come up with a satisfying ending then good for you, otherwise pick up where you left off and finish the novel.